Home / Horse Racing / Equine flu: 174 stables in lockdown – what now for horse racing, Cheltenham and jockeys? Meltdown. Lockdown. The headlines tell a tale, but what is likely to be the real impact for British horse racing of the equine flu crisis? A six-day shutdown of race meetings has been ordered and 174 stables are in quarantine as the sport’s rulers try to contain the highly contagious disease. So what could happen next? When might racing resume? What are the odds on the showpiece Cheltenham Festival taking place next month? Could other areas be affected? And are there any plus points from the crisis? Will the Cheltenham Festival be on or off? That is the £200m question. Or whatever the exact figure is of the cost to the racing, betting and hospitality industries of cancelling the four-day meeting which is due to welcome 250,000 spectators to Gloucestershire from 12 to 15 March. The truth is no-one definitely knows until tests on thousands of horses are analysed. That means scores of vets analysing the giant cotton buds and samples sent off to laboratories. Flu can lay humans low, and it does the same to horses – but a deep cough or seriously runny nose is bad business in an arena where the animals need to be in prime condition. By suspending all racing until Wednesday at the earliest, the British Horseracing Authority (BHA) has some breathing space, with an update to come on Monday on the next steps. Some vets have questioned the move – “it’s not Ebola” has been uttered – although the decision appears to have been broadly supported. Restrict movement and restrict the chances of it spreading. Privately, some have been preparing for a minimum two-week break, which would threaten meetings next weekend, although it is a fast-moving situation and that could change. The sometimes-maligned BHA will have been prepared this year for questions over safety improvements after seven horses died as a result of injuries sustained at last year’s Festival. But the focus has changed, for now. Swift and decisive action is designed to produce some long-term gain from the short-term pain. “They have handled it very well and given every chance of clearing it up as soon as possible,” legendary former jockey Sir AP McCoy told BBC Sport. What are the consequences of a racing shutdown? Racecourses and bookmakers would appear to be two of the obvious major groups to lose out as meetings are cancelled. But the major modern-day bookies are less reliant than in the past on racing as a source of income – with betting on other sports, particularly football, and casino games among big growth areas in recent years. “At the weekend, a ‘leisure’ punter would probably have a set budget and just switch to the football or something else,” said one bookmaker. With 23 meetings off over the six-day shutdown, tracks will lose revenue and trainers could miss out on important pre-Festival prep races for their stable stars. Racing continues in the Republic of Ireland so the traditional Irish-British battle for winners at Cheltenham may tilt in the smaller nation’s favour. This is the big fear, but a potential misreading of the situation. Racing fans over the age of 35 will clearly recall the 2001 national outbreak of foot-and-mouth disease in animals that ultimately led to the Festival being called off, before the Grand National meeting in April took place under heavy ‘biosecurity’ precautions. Insiders from that situation 18 years ago are reluctant to draw parallels as that was effectively “shutting down the countryside” while the flu is “shutting down racing”. 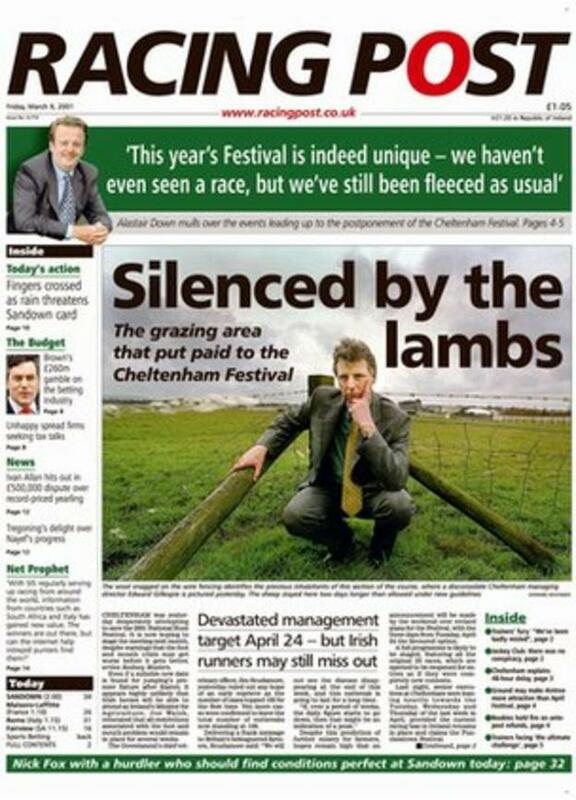 That Festival was ultimately scuppered by some infected sheep close to the Prestbury Park track, prompting the Racing Post headline: ‘Silenced by the lambs’. This time round is different, says Bruce Millington, who was Racing Post editor until late last year. “Equine flu and foot-and-mouth disease are two entirely different things. There is a basic parallel, but it is incomparable,” he said. In the inner sanctum of BHA headquarters in London’s High Holborn, a routine Cheltenham planning meeting took place on Friday morning. Business as usual. No public talk of contingency plans. Only one bookie is offering odds on whether Cheltenham will go ahead – the Irish firm Paddy Power make it favourite to do so at 1-4, while the cancellation is rated a 2-1 chance. So cautious optimism, then. Though as any racing punter knows, odds-on favourites don’t always oblige. There are only a handful of days in the year when horse racing is not scheduled so time off can be good news for some, but not others. McCoy, who was champion jockey 20 years running, recalls going to Dubai for a break during the foot-and-mouth shutdown with other riders, including Carl Llewellyn and Mick Fitzgerald. “I imagine a lot of the younger lads these days going skiing. I’d never have done that – I’d be too worried about getting injured,” he said. An elite jockey like McCoy – who smashed records as he racked up more than 4,000 career winners before retiring in 2015 – would make a good living from riding, but time off is a concern for others further down the pecking order. “It’s all right for those who have got a few quid but there will be jockeys with young families who will find it tough,” he said. While some riders have retainers with owners or are employed by trainers, most rely on race riding fees and prize money as their sole sources of income, said Professional Jockeys’ Association (PJA) chief executive Paul Struthers. “With average earnings after expenses but before tax of about £25,000 to £30,000, an extended period of no racing could cause financial issues. Analysis – what’s the mood in the sport? It’s a funny old feeling; no racing at a busy and important time of the jumps season, and nervous anticipation about what happens next. One more positive test and nerves will be jangling. There’s no question of Cheltenham being in doubt at this stage, so hopefully the biggest headache will be the one for trainers trying to work out what to do to get their charges to the Cotswolds in March in tip-top shape despite the enforced break. Actually, what would help – if precedent is followed, and a clean bill of health is given – the important ‘Super Saturday’ Festival springboard at Newbury might become ‘Fab Friday’ next week as it has been when the fixture was lost previously, principally to the weather. It is worth saying that racing is able to take a six-day hiatus in its stride – it is used to it because of snow, frost etc at this time of year – but if that was extended, frustrations will increase. Potentially, although Irish racing continues, albeit with British runners barred from travelling. In addition to the Festival over jumps, one of the year’s richest flat race meetings takes place in March – the Dubai World Cup. Whether runners with a GB stamp are welcome at Meydan remains to be seen. This is the calm before the storm for flat racing, but not for the bloodstock industry where the breeding season, with no little irony, is always scheduled to start around 14 February, Valentine’s Day. Mares are brought in from various locations to mate with super studs such as Frankel, the Newmarket-based stallion that commands a fee of £175,000 a time. The British Equestrian Federation says, for now, that its events will not be affected. Whatever happens, the training plans of leading racing figures such as Nicky Henderson, Paul Nicholls, Colin Tizzard and Jonjo O’Neill will be hit. Many would regard an outing somewhere between three and five weeks (21 to 35 days) beforehand as the ideal final warm-up for the Festival. Three more cases were confirmed on Friday when 32 days remained until the sound of the ‘Cheltenham Roar’ which greets the start of the opening Supreme Novices’ Hurdle. And there’s the human stories – Andrew Gemmell, blind since birth, who owns Paisley Park, the favourite for day three’s Festival feature race, the Stayers’ Hurdle. And Kayley Woollacott, who took over the training licence after her husband Richard died aged 40 last year after suffering from mental health issues. Kayley and young daughter Bella – or the ‘small trainer’, as she likes to call her – will be hoping to cheer on stable favourite Lalor, a leading contender for the opening day’s Arkle Chase. Will they be in such a privileged position next year? We are in a waiting game. Seeing what the test results bring, how the wind blows. Ruth Jefferson is another of those ‘human interest’ stories, succeeding her well-regarded father Malcolm after he died last year. Her big hope is Waiting Patiently, so named because he waited patiently for his breakfast as a young horse. Jefferson has been forced to cope with ground which has been too dry for her talented gelding and the horse being brought down in the King George VI Chase on Boxing Day. He could provide a poignant winner in the Ryanair Chase at Cheltenham, if it does go ahead. “Like everyone else, we are waiting patiently to see what happens,” she said. Grand National 2019: Full result, finishers and fallers – where did your horse finish?